Stir Fried Vegetables | May You Cook It! Stir frying is a general term used to describe a Chinese cooking technique (chǎo) which involves heating a small amount of oil in a wok before adding spices then frying meat and/or vegetables while tossing the ingredients swiftly together. The term was first penned by Buwei Yang Chao in her book How to Cook and Eat Chinese and has since become a conventional description of many other Asian dishes using a similar style of cooking. I love the tastes and spices in Chinese cooking and I particularly enjoy the light and fresh flavour of this recipe. Its good to have as a side dish but is also delicious on its own. Heat the wok and add the oil. Add the ginger and stir fry until aromatic. Add the cuttlefish and swiftly stir fry until cooked. Add the remaining vegetables and stir quickly. Add the sauce into the wok and stir until the sauce thickens. Transfer the vegetables into a dish and serve immediately. 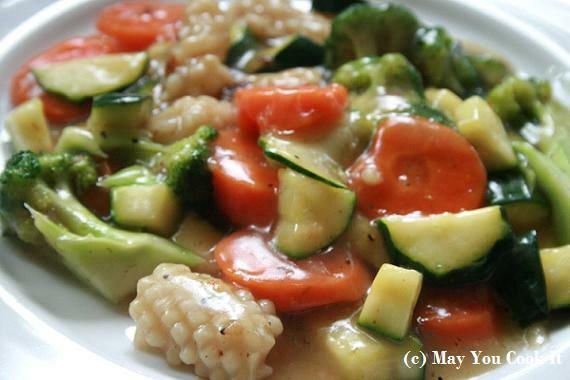 This entry was posted in Vegetables, Vegetables and sides and tagged Stir Fry, Vegetables on January 12, 2013 by m.